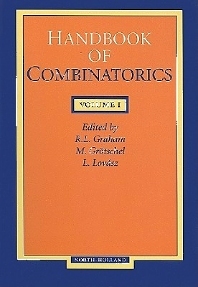 Handbook of Combinatorics, Volume 1 focuses on basic methods, paradigms, results, issues, and trends across the broad spectrum of combinatorics. The selection first elaborates on the basic graph theory, connectivity and network flows, and matchings and extensions. Discussions focus on stable sets and claw free graphs, nonbipartite matching, multicommodity flows and disjoint paths, minimum cost circulations and flows, special proof techniques for paths and circuits, and Hamilton paths and circuits in digraphs. The manuscript then examines coloring, stable sets, and perfect graphs and embeddings and minors. The book takes a look at random graphs, hypergraphs, partially ordered sets, and matroids. Topics include geometric lattices, structural properties, linear extensions and correlation, dimension and posets of bounded degree, hypergraphs and set systems, stability, transversals, and matchings, and phase transition. The manuscript also reviews the combinatorial number theory, point lattices, convex polytopes and related complexes, and extremal problems in combinatorial geometry. The selection is a valuable reference for researchers interested in combinatorics. Graphs. Basic graph theory: paths and circuits (J.A. Bondy). Connectivity and network flows (A. Frank). Matchings and extensions (W.R. Pulleyblank). Colouring, stable sets, and perfect graphs (B. Toft). Embeddings and minors (C. Thomassen). Random graphs (M. Karo&nacute;ski). Finite Sets and Relations. Hypergraphs (P. Duchet). Partially ordered sets (W.T. Trotter). Matroids. Matroids: fundamental concepts (D.J.A. Welsh). Matroid minors (P.D. Seymour). Matroid optimization and algorithms (R.E. Bixby, W.H. Cunningham). Symmetric Structures. Permutation groups (P.J. Cameron). Finite geometries (P.J. Cameron). Block designs (A.E. Brouwer). Association schemes (A.E. Brouwer, W. Haemers). Codes (J.H. van Lint). Combinatorial Structures in Geometry and Number Theory. Extremal problems in combinatorial geometry (P. Erdös, G. Purdy). Convex polytopes and related complexes (V. Klee, P. Kleinschmidt). Point lattices (J.C. Lagarias). Combinatorial number theory (C. Pomerance, A. Sárközy). Author Index. Subject Index.